I added a new email address for Project Gridless. 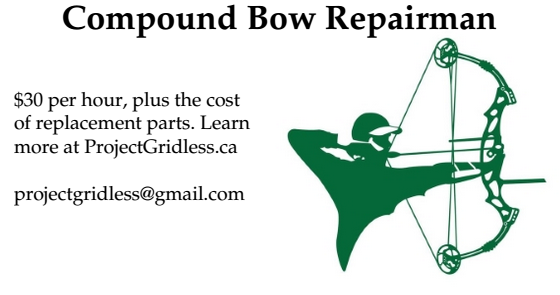 The new email just forwards to one of my other accounts, but I needed it for new Project Gridless business cards I am making which will promote my Compound Bow Repair service. I am going to staple up some copies of the business card at the Toronto Archery Range once in awhile to drum up business my repair service. Plus it is handy to have whenever I see someone who is trying to fix their broken compound bow. The business card I designed is simple and to the point. I don't need to clutter it with extra info. Note also that I did not include my phone number. Last thing I need is people phoning me while I am changing Richard's diapers, while I am teaching an archery lesson, or while I am having a nap. (When Richard naps, I try to have a nap too.) Email is best in my opinion, especially since people often send me photos of their damaged bow so I have a better idea of what is broken.